This week I came across Denise Fleming's birthday. I knew I had a few books in my house that she had written. I had always thought the illustrations in her books were different and unique. So, I thought I would reread a few books to see if there was enough to write about. The books I found were, In a Small, Small Pond , The Cow Who Clucked , Lunch , Count and Once There Was a Wood . After rereading these books, I started reading about Denise Fleming online and I found out something very significant about her. She illustrates her books through the art forms of paper making and pulp painting. I was so happy I learned this fact about her as an author and illustrator. It immediately explained why her illustrations are so unique. To illustrate her stories she adds color to pulp and then adds the pulp to stencils to make her beautiful images. I believe I just did a disservice to the difficult process of making these images by summarizing it into one sentence (you can read her words about the process - click here). After finding out more about her work, I felt compelled to celebrate her birthday. I needed to share my new found knowledge. I found myself having a greater appreciation for her books and I hope you will too. I went to the library to look for more books in addition to the few that I already found in my house. I gathered nine Denise Fleming books in all. My 2 year old son and I read them over two book sessions before nap time. His favorite was The Everything Book . This book was dedicated to Fleming's daughter, Indigo, who really inspired her to write her own books. This book does have a little of everything - poems, basic concepts, labeling of objects. It moves at the pace of my two year olds mind, quick and impatient. I enjoyed Buster and Buster Goes to Cowboy Camp . They were a little too much for my two year old, but I thought they had a unique style that you normally do not see in picture books. They are set up in short increments, almost like chapters with titles. This offers a breaks in the story to allow the young listeners or readers to make predictions or to discuss what has already happened in the story. Buster is a story about a dog that is completely satisfied with the way things are going in his life. His routines are set and he loves his special spots in the yard. Everything is great until a cat comes into his life and causes a few problems including getting lost at the park. Ultimately, it is the cat, Betty, that helps him find his way home. This event does lead to a new friendship and realization that things are even better now with Betty in his life. Buster Goes to Cowboy Camp is all about going to camp and all the emotions that happen throughout the experience. Buster is homesick, shy with all the new dogs, nervous about new activities, and desiring to return to a more comfortable place. However, after some success with activities and the other dogs, he loves his time at camp and the days fly by with fun! I have always liked alphabet books. Denise Fleming has one of her own called Alphabet Under Construction . It stars the mouse character from one of her other books, Lunch. The theme of this alphabet book is constructing the letters of the alphabet in a creative and crafty way. The mouse folds the letter F out of fancy paper, kinks straws for the letter K, and saws the letter S out of wood. It is a very cool book for all young readers. This is a last minute addition to my post. I stumbled upon the book, Time to Sleep , at the library today. It was in the new book section and I missed it before. This is a very simple little story about the animals that need to get ready for winter. Each animal communicates to the next to remind them about what they need to do to prepare for winter. The communication works its way in a circle when Ladybug accidentally wakes up Bear to tell her that she needs to go to her cave and go to sleep. It is very cute and appropriate for these wonderful winter days! 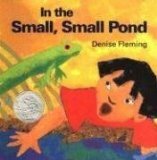 This week I hope you are able to read a few of Denise Fleming's books and find an appreciation for her illustrations as I did! 5. 2011 Happy Birthday Author Celebration - Meeting Denise Fleming and Pulp Painting!